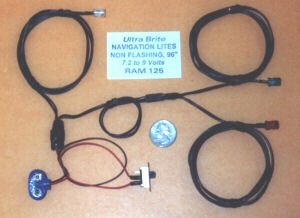 This system now includes 4 ultra brite LEDs, 3 non flashing red, green and white nav lites with one flashing white LED for top or bottom of the fuselage. This 8 foot (96 inch) span set has 2 connectors for easy wing detachment and a 4 foot wire to the tail. Comes complete with switch and is powered by any 6 to 12 volt source. $34.95.